Waihōanga is a beautiful place to explore something new: from activities in the high ropes course and on the river, to gentle relaxation or meditation, to gaining new knowledge and insights about local plants, lifestyle choices and bushcraft skills. We love to host guests at the Waihōanga River Lodge and Retreat, and to introduce you to people in the area who offer a wide range of activities. We don’t organise programmes for you, however, as we’ve found it’s important for our guests and the activity providers to liaise directly in order to ensure the perfect, tailored, experience for all. We’re very happy to suggest contacts, and provide an initial introduction. Of course, even without these organised activities, all of our guests have access to beautiful walks around our property and the area, and our private river beach – perfect for swimming and playing on the rocks all day. Many of our guests like to “get their hands dirty” while staying at Waihōanga, and we’re happy to bounce ideas around with you about what might work for your group or event – be it running the ropes course for corporate groups or a birthday party, going tramping in the Tararua Forest Park (day hikes or staying overnight in a hut with great food and local wines…), or physical activities around the property like cutting paths, shifting wood, and helping out in the gardens. The Waihōanga Ropes Course has its own private access so can be hired for half or full day activities, completely independently from any lodge bookings. You can also make the ropes experience a unique part of your stay at the Waihōanga Centre – special discounts apply! For more details, please visit the Ropes Course page. The Waihōanga Ropes Course is operated by the Makahika Outdoor Pursuits Centre, with whom Andy is one of a number of certified operators. Makahika has been is audited at Waihōanga by AdventureMark and is approved by WorksafeNZ as an Adventure Activity provider. Ed is an experienced yoga and pilates instructor who can run sessions, tailored to the group’s size and needs, in the Waihōanga yurt. Please contact Ed directly to discuss options with him. Tonya is a UK certified holistic massage therapist and yoga instructor . She has over 20 years experience working world wide in many resorts as well as on the National Geographic explorer ship. Please contact Tonya directly to discuss options with her. The Captivate team have been running rafting adventures and school programmes at Waihōanga for over thirteen years. Activities include white water rafting (day and night trips available), high and low ropes courses, rock climbing, abseiling, mountain biking, guided bush walks, and archery. Captivate Adventures are audited (OutdoorsMark) and approved by WorksafeNZ as an Adventure Activity provider and by Maritime NZ as a commercial rafting operator. Ali Sutherland is another neighbour to Waihōanga, and can offer herbal and wild-weed walks and medicine making workshops, including helping you create a blended herbal infusion, a tonic vinegar, herbal oils, or balm. She is also a highly respected speaker, happy to join a group during the day or evening and share her knowledge of herbs and health. Steve and Jenny live a short walk from Waihōanga and can arrange tailored experiences for your group either on their property or at Waihōanga. From wild food foraging to bird language, tracking, bushcraft and survival skills to native parenting techniques, wandering and nature connection for kids, our guests always leave their time with Steve and Jenny seeing the world through refreshed eyes. Is spontaneous: quick turnaround of images. Fiona is a born-and-bred Kapiti Coast local and owns several local cafes and eateries, including Sunday Cantina in Waikanae. She can cater for every occasion and all dietary requests, using delicious, fresh, locally inspired and healthy food. Fiona also provides cooking classes at her cafe or at Waihōanga. Her cooking classes are an interactive and tasty way to create new memories, while learning about different dishes and picking up some chefs’ tips and tricks. Of course you get to enjoy all the foods you’ve cooked during the class. Anna and Rob support people to express their creativity fully and to connect with themselves and others more honestly. They also live close by and are able to host workshops, private consultations and retreats either at their property or in the Waihōanga yurt. They have a wealth of talents in music, performance, choreography, breathwork, dance, hypnotherapy, and as change facilitators and integrate non violent communication and NLP into their practice. 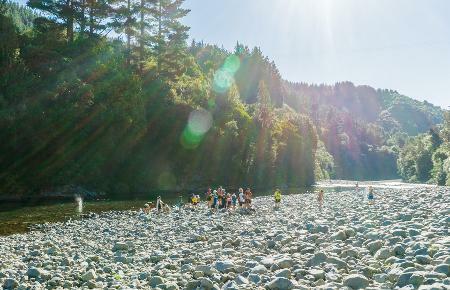 There are a number of gorgeous walks in the area – from half hour strolls by the river to 2-hour circuits in the bush, to multi-day treks in the Tararua Forest Park, the access to which is only 8km from Waihōanga. If you’re interested in having a guide along, please ask us – Andy (and our dog, Bryn) might well relish the chance to show you our beautiful backyard! The Gate – walks on a local private property, including to the historic Arcus Dam.